Cranford Engineering is a state of the art toolmaking business manufacturing steel moulds for the rubber industry. Mould tools are nearly always ordered by a rubber company, such as Belpar Rubber Co.with whom we’ve been working for decades. The rubber company is generally the end client’s principal point of contact. The rubber company and the client will thrash out how the best results can be obtained given the volume requirement, material properties and the budget. When everything is clear, we receive a sketch or a drawing or 2D or 3D CAD data (normally IGS data) of the product they wish to make. We convert all the given information into a 3D solid model on our fully up to date tooling software and get further approval if needs be. Once approved, we progress our model further to include the desired number of cavities and a workable layout. When we’re satisfied, we order the steel. 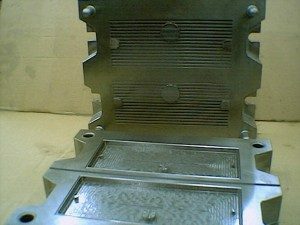 We continue our work on the model until it is a drafted mould tool complete with press mountings, injection runners, vacuum take-offs, doweling, engraving and trim beads. The steel takes about a week to arrive. Longer if there are heat treatment requirements. In that time we can make a start on any spark erosion electrodes than we may need. We make graphite or copper electrodes depending on the complexity of the part and we quite often have these ready before we start working on the steel. As soon as the steel arrives we dowel the plates together and they are trimmed true to the dowels. We can then start on the the body of the tool. We have CNC and manual spark eroders, lathes and milling machines giving us the ability to quickly and accurately remove metal. Within a few weeks we turn blocks of steel into a fully functioning mould tool. Delivery to the rubber company is by our own transport which gives us the opportunity to discuss with them any issues or any further work they may be looking to place. CALL US if you have a need for rubber parts or mould tools – we can quickly get you a price and delivery date.